Calling Pastors, Prophets, and Intercessors! 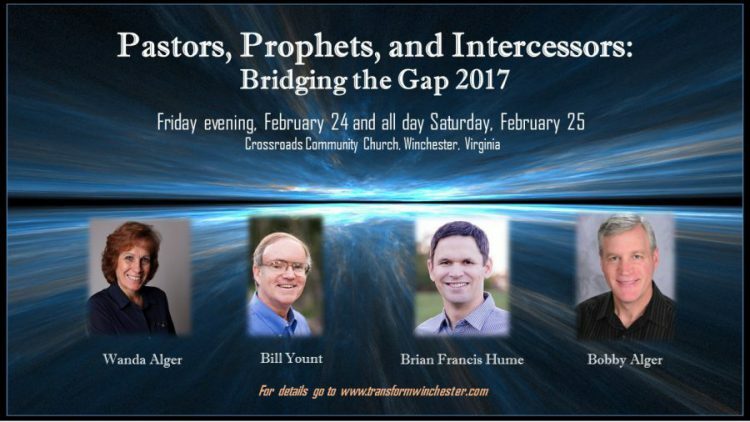 Join us for this 2-Day Conference hosted by Crossroads Community Church in Winchester, Virginia! Our prayers and proclamations have greater authority when we get rightly aligned, not only with heaven, but with one another. At a time when healthy apostolic/prophetic ministry is critical, this gathering will address common communication gaps and misunderstandings within the Church and bring clarity to the calls and functions of our gifts in this season. So often, pastors don’t know what to do with prophets in their midst, prophets feel misunderstood and rejected, and intercessors are caught in the middle. Until these gaps are closed, our prayers for transforming revival will be limited. Before we can see any change on a national level, we must start in our own communities. We believe this conference will open the way for healing, reconciliation, and a fresh revelation concerning the power of our partnerships in the kingdom. We will seek heaven for a greater oneness of His Spirit as we contend for revival in our nation and in our own back yards. There is no cost for the conference, but you must REGISTER due to limited space. CLICK HERE. Free-will offerings will be received. Follow our FACEBOOK page for ongoing updates, or go to www.transformwinchester.com. Friday, February 24 – 7 p.m.
Saturday, February 25 – 9 a.m. – 5 p.m. and 7 – 9:30 p.m.
Wanda Alger is a recognized five-fold Prophet with Dove Christian Fellowship International and a Field Correspondent with Intercessors for America. She writes a prophetic blog at wandaalger.me and is a frequent contributor to Charisma magazine online. She also wrote the 2005 book, “Surely Not Us: Exposing the Religious Spirit in the Spirit-Filled Church”, and co-wrote with her husband, Bobby, the 2015 Devotional, “Making Room For His Presence: A 21-Day Community Fast Devotional”. Bill Yount has been a member of Bridge of Life in Hagerstown, Maryland where he is now an Elder, and a home missionary for the past 40 years. As a nationally-recognized Prophet, Bill’s words have been seen on The Elijah List since its early years and he is the author of several books, including “Prophetic Stones of Remembrance”, “I Heard Heaven Proclaim”, and “Some Hear Thunder, I Hear a Roar”. He is currently an Advisor at Large for Aglow International and is also a member of the Apostolic Company of Alliance International Ministries. Bill can be contacted through his website at www.billyount.com. Brian Francis Hume is a writer, intercessor, revivalist, and prophetic minister. Through his years of ministry, he has been a pastor, entrepreneur, consultant, and book publisher. Brian frequently travels and ministers alongside other national leaders, in addition to serving his own community near Washington, D.C. He can be contacted through his website at www.brianfrancishume.com. Bobby Alger is founding Pastor of Crossroads Community Church in Winchester, Virginia, which was planted in 1998 and is a partner church with Dove Christian Fellowship International. Bobby has been involved in numerous community prayer initiatives in Winchester and surrounding communities involving both pastors and intercessors. Following a 21-Day Community Fast in 2012, he launched “Pray Winchester”, a community-focused weekly prayer fellowship. Bobby has written a discipleship book, “Living a Changed Life” (2015) and co-wrote with his wife, Wanda, “Making Room for His Presence: A 21-Day Community Fast Devotional”. You can also visit transformwinchester.com and share with others. FOR PRINTABLE FLYER, CLICK HERE.